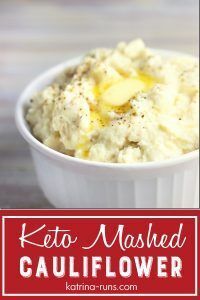 When people begin experimenting with a keto eating plan, one of the most mourned dishes on the “don’t” list is mashed potatoes. 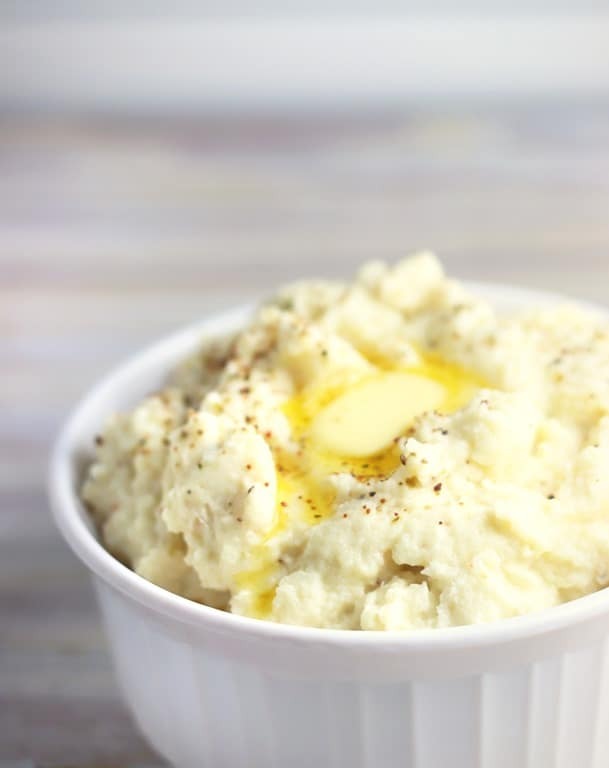 Especially around the holidays when traditional family recipes are on the horizon, telling Grandma that you want mashed cauliflower is just plain sad. I’m sure the responses have been less than enthusiastic. In most cases, you’re probably better off bringing your own keto-fied dishes if you’re the only one at the table sticking to a grain-free diet. In my personal viewpoint, I say enjoy the family dishes if you can. 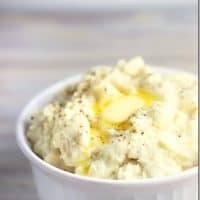 For those 1 or 2 family meals when everyone is around the table and the kids are fighting over the kids’ card table and Aunt Matilda is asking why you haven’t gotten married yet, a few bites of real mashed potatoes might be what you need to survive. For those of us who want to enjoy the taste and texture of mashed potatoes and still be able to wear our rings and jeans the next day, I have finally found the answer to the mashed cauliflower problems. Problem 1: my former attempts have been too watery and grainy. Problem 2: my former attempts still require a couple of 3-wick candles and an essential oil diffuser just to be safe. The cauli-FUNK is real and it’s not very pleasing. I should have known that cheese would be the answer. Cheese and fat. Of course, keto lovers know that fat is our friend and melting fat off our bones by eating fat is just one of life’s greatest mysteries that we don’t question. Cooking cauliflower dry and blending with fats and cheese makes the best bowl of creamy sticky mashed goodness. I promise. But if you still don’t like it, stay tuned for an upcoming Thanksgiving roasted cauliflower mash. I have high hopes it will top the rest. Tired of watery stinky mashed cauliflower? I was too. Try this instead. When you chop your cauliflower florets, make sure to remove any hard fibrious stalk membranes. Those contribute to graininess. If you use pre-chopped cauliflower from the produce section, check those stalks. Place cauliflower in a micro-wave safe bowl and cook for 6 minutes. Remove, stir, and add cream and 1 tbsp butter. Cook 4 more minutes. 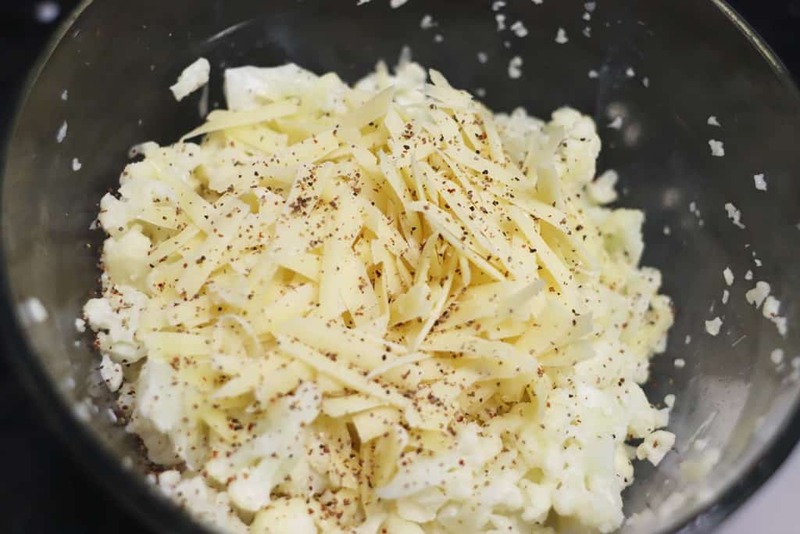 Remove cauliflower and add shredded cheese and garlic. Add salt and pepper, if needed. 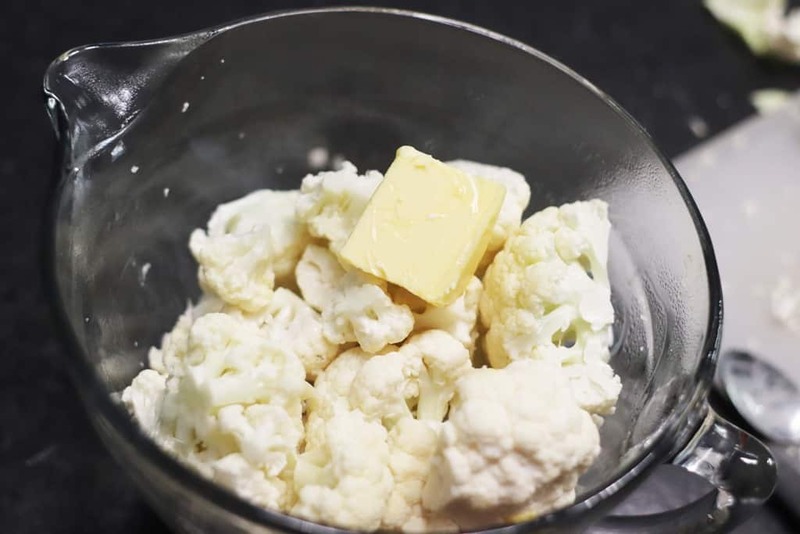 Pour entire mixture in a blender and blend the cooked cauliflower to desired consistency. Remove, top with remaining butter, and serve immediately. Cooled cauliflower will be grainy!